Raja Ampat homestay operators prepare three simple meals a day on site, the cost of which are included in your room price. Don’t expect to be able to choose from a restaurant style menu at homestays. With some exceptions, meals are basic and usually repetitive in nature. Meals are almost always slightly westernised versions of traditional Raja Ampat fare. Breakfast is the meal that most guests find least satisfying. Breakfasts at most homestays are the same as local people eat and are most often fried. Bananas, plantains or yams, and the local version of the doughnut (some of which can be exceptionally delicious) are commonly served. Midday meals might be rice based with perhaps some chicken or fish, maybe in a soup. Tempeh and tofu figure occasionally at some homestays. Evening meals are usually larger versions of lunch with freshly cooked fish and/or chicken and rice meals served with local vegetables. Desserts of fruit in season or sweet dumplings might also be served. Fish – always fresh and delicious – naturally features large in the Raja Ampat menu and can be served in a variety of ways. Papua has no tradition of widespread cultivation of fruit, so – surprisingly for many – fresh tropical fruit (with the exception of banana) is not widely available. If you’re vegetarian or vegan, consider bringing some of your favourite protein in case local tempeh and tofu supplies are low. If you have other special dietary requirements or want something more than local cuisine your only choice is to bring the ingredients with you or to visit one of the resort restaurants. 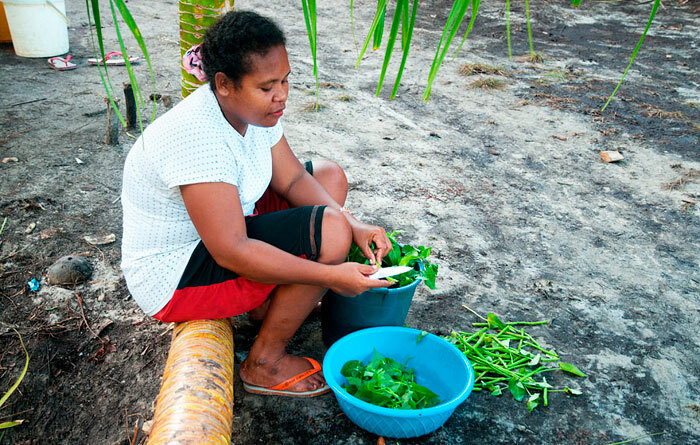 If you want to know more about traditional food in the islands see our Raja Ampat local culture page. Tea, coffee and drinking water are supplied free of charge around the clock at most homestays. Due to the previously mentioned lack of fruit, fresh fruit juices are almost impossible to come by, as is alcohol. Beer is the only alcohol that can easily purchased in Raja Ampat, but homestays are not licenced to sell it, and it is not widely available. Waisai, a local shop in Sawinggrai on Gam and a shop on Arborek are the only places we’ve discovered so far that always have it available. If a daily beer is essential, then it’s best to purchase a supply before you leave Waisai. Various canned and bottled drinks (mainly of the carbonated variety) are available in small village shops, but are usually sold warm due to a lack of constant electricity supply to run refrigerators. For more about drinking water – and why you shouldn’t resort to bottled water – see the Raja Ampat drinking water page. The culture of the northern Raja Ampat islands is predominantly Christian, so certified halal food is almost impossible to find outside the larger towns. Certified halal food is easy to find in Sorong and is also available in Waisai, but once you’re out in the islands proper halal food is non-existent as far as we know. Please leave a comment on this post if you can tell us otherwise! Note that homestays will always do their best to serve halal food when asked to. Bottom line on Raja Ampat homestay food and drink? If you can’t bear to be without it, bring it with you! How is the coffee in the homestays? I am a bit coffee addict and my mornings don’t start without a good cup of black magic, but I need sugar and milk in it too. I assume that there is no milk available and I am prepared to bring milk powder, but I wonder that if milk even tastes good with RA coffee? I mean that some coffees and milk don’t go well together. (Like the traditional coffee in Turkey contains actual coffee beans and adding milk makes it awful porridge.) So should I just bring my own coffee or is milk powder enough? And is sugar commonly available or should I bring it too? If high quality morning coffee is essential, then we’d suggest bringing everything you need (except sugar) with you. You can buy good quality high-altitude Papuan coffee in Sorong, and probably Waisai as well, although we haven’t looked for it there. Coffee comes in two kinds at homestays: Premixed sachets of coffee & sugar, or coffee, sugar and milk powder/whitener, and (much more commonly) a cheap ground coffee that is made instant-coffee style by pouring water on coffee in the glass. Fresh milk is indeed unavailable, but many homestays provide tinned, evaporated (or sometimes condensed) milk. Sugar is everywhere. With new government rules barring alcohol for sale in Sorong and Papua..is that also in RajaAmpat? It seems likely Steve, but we haven’t had confirmation of that yet. Will know more after we return next month. I was on Kri this week and at least two homestays sold beer there. I read that some homestays (including the one I will be visiting) have rats. If we bring some food like energy bars, nuts, etc, where will we put it so not to share with the rats? Good strong airtight containers are the only way to stop Kri’s rats from eating your food. Keeping it in airtight containers will also minimise attracting them to your room. If staying at a homestay with a refrigerator you could ask for it to be stored there too. You can hang your food by the rafters in bags with rope. am i able to buy whiskey and vodka? avaliable in bottles off the shelf? Hi Mick. You’d be able to get those in Sorong I reckon, but I couldn’t tell you where. Maybe in Waisai too, but again I’ve never seen them anywhere. Nowhere else though. Might be best to bring them! Is it possible to find lager beer like Bintang in Waiwo Beach, Waisai area? Yes – Bintang is available at resorts and in Waisai and also by arrangement at some homestays. Cheers!